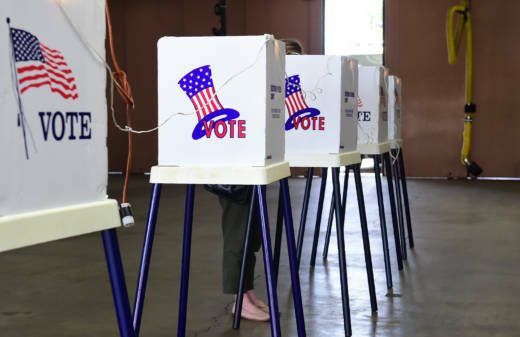 California voters will be asked to decide on 12 measures in November's election, on topics ranging from housing to health care to taxes. The Secretary of State's office certified the final list of ballot measures on Thursday, after a series of last minute deals scrapped potential ballot measures on lead paint cleanup, local taxes, and internet privacy. Housing Bond: As part of last year's legislative push on affordable housing, state lawmakers placed this $4 billion housing bond on the ballot. If passed, the state will issue bonds that will largely fund the construction of low-income housing. Another billion will go to the Cal-Vet Loan Program, which provides home loans to veterans in the state. Homeless Bond: In 2016, the legislature approved a $2 billion bond to fund new housing for homeless Californians, using money from a tax on millionaires. The bond has been held up by a legal challenge that contends that the money was originally earmarked by voters for mental health services. If approved, this measure will resolve the legal question and allow the money to be spent on housing. Rent Control: This measure would free California cities to expand rent control by repealing the Costa-Hawkins Rental Housing Act. For more than 20 years, that law has blocked cities from placing rent control on new buildings, and allows landlords to reset rents to market rate prices once a rent-controlled apartment is vacated. The initiative is being pushed by the AIDS Healthcare Foundation, after a bill to repeal Costa-Hawkins failed in the legislature earlier this year. Expand Proposition 13: When voters passed Prop. 13 in 1978, it rolled back property taxes and placed a cap on annual property tax increases until the property was sold. That keeps taxes relatively low. A typical longtime homeowner who sells his or her home and buys a new one in California often sees their property tax bill skyrocket, since it's based on current market value. This measure, backed by the California Association of Realtors, would allow some homeowners to take their existing tax savings with them to the new property they buy. 3 Californias: Venture capitalist Tim Draper's ballot measure would divide the existing state of California into three new states with roughly equal numbers of people. Draper, who also backed a previous effort to divide California into six new states, has spent nearly $2 million on this one. Even if voters pass the measure in November, it would still face formidable legal and political hurdles. Congress, the President and the State Legislature -- not to mention the courts -- would also need to approve it. Gas Tax Repeal: In 2017 Governor Jerry Brown signed off on legislation increasing California's gas tax and vehicle fees to fund transportation improvements. The measure was projected to raise about $5 billion a year for 10 years. But the increased taxes angered Republicans who said there were other ways for the state to fund road repairs. They launched an effort to place a repeal of the tax on the November ballot. Now voters will decide whether to keep the increase or reject it. Water Bond: In June California voters approved a $4 billion bond that included money for water infrastructure and flood protection projects. In November they'll get to decide if the state should spend an additional $8.9 billion on water projects. The November water bond would provide money for drinking and waste water treatment, groundwater sustainability and conservation programs among others. Daylight Saving Time: Approval of this proposition would move California closer to being the first state with year-round daylight saving time. Proponents argue that more hours of daylight in the evening will mean fewer car accidents and more time for Californians to exercise outdoors. If the measure passes, the legislature would have to approve a bill to make the change official, and also gain a waiver from the U.S. Congress. Farm Animal Confinement: In 2008 voters approved Proposition 2, which prohibited farm animals from being confined in crates that did not allow them to to turn around freely, lie down, stand up, and fully extend their limbs. The 2018 proposition would ban the sale of meat and eggs from veal, breeding-pigs and egg-laying hens unless the animal's enclosures met specific square-footage requirements. For instance, meat from veal could not be sold if the animal was kept in an area with less than 43 square feet of usable floor space per calf. Children's Hospital Bond: This measure would allow the state to issue $1.5 billion in bonds to fund improvements at the state's 13 children hospitals, as well as other hospitals that serve children in California. Those improvements could include new construction, expansions, remodeling, or refinancing of the hospital sites. Dialysis Regulations: Health care unions are backing this measure that would cap the profits of companies providing dialysis, or blood filtering, for patients with kidney failure. The measure sets a baseline for the cost of the treatment, and then caps the companies' profits at 115 percent of the cost of care. Any revenue above that threshold would have to be sent back to private health insurers. On-Call Breaks for Paramedics and EMTs: A 2016 State Supreme Court ruling found that requiring workers to remain on-call during their meal and rest breaks (a common practice among ambulance workers) was unconstitutional. This ballot measures seeks to codify that past practice and requires private-sector EMT workers and paramedics to remain on-call throughout their work day.